Jakarta – As a subsidiary company of PT Pertamina (Persero) in lubrication solutions for the automotive and industrial sectors, PT Pertamina Lubricants is expanding its business by opening Pertamina Lubricants Representative Office Australia in Sydney. The existence of representative office is a strategic step of PT Pertamina Lubricants to continue to strengthen its presence in the international market and the global market network, while continuing to introduce the world-class lubricant products from Indonesia to the world. With a representative office in Sydney, PT Pertamina Lubricants is committed to providing leading-edge services to consumers in the Australian region. The inauguration ceremony of representative office was organised at House of Indonesia, Sydney. It was marked by signing and ribbon-cutting and presented by the President Director of PT Pertamina Lubricants, Afandi, accompanied by the Ambassador of Republic of Indonesia to Australia and Vanuatu, Kristianto Legowo and Consulate General of Republic of Indonesia to New South Wales, Queensland, and South Australia, R. Heru Hartanto Subolo, as well as the Sales & Marketing Director of PT Pertamina Lubricants, Andria Nusa. Also presence at the ceremony, Trade Attaché Canberra – Australia, Nurimansyah, Head of Indonesia Trade Promotion (ITPC) Sydney, Agung Haris Setiawan, Director of Indonesia Investment Promotion Center (IIPC) Sydney, Sri Moertiningroem, and Director House of Indonesia, Suliyanti Sunaryo. In his speech, the Ambassador of the Republic of Indonesia to Australia and Vanuatu, Kristianto Legowo, said that there are two things that become government priorities, first is to increase export and second, to introduce local products to foreign countries. He gives his full support towards Pertamina Lubricants to continue to advance globally, carrying the name of Pertamina and Indonesia to worldwide. He also showed his appreciation for the cooperation of Pertamina Lubricants and Automobili Lamborghini where Pertamina Lubricants is a Technical Partner for the whole event of motorsport and supercar organised by Automobili Lamborghini. 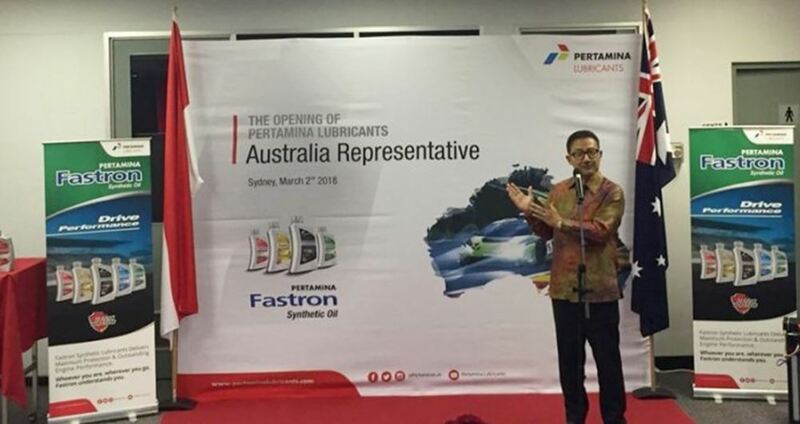 President Director of PT Pertamina Lubricants, Afandi, said that the existence of the representative office of PT Pertamina Lubricants in Sydney is a good start to target the Australian market deeper in the future. “In accordance with our principles and objectives, PT Pertamina Lubricants is getting closer to its consumers and potential customers, where we can directly adapt to the development and market changes in Australia,” he explained. On the same occasion Afandi added, so far Australia lubricants market is very potential which has drawn PT Pertamina Lubricants interest to expand and develop its market opportunities within the Autralian continent. “We are determined to encourage exports of lubricants, in addition to maintaining the domestic lubricant market share which now has reached 60%,” he said. PT Pertamina Lubricants is a subsidiary company of PT Pertamina (Persero) which has expanded its business in more than 17 countries in the world, including Australia. Since its establishment as a subsidiary company in the year 2013, PT Pertamina Lubricants already owns 16 distributors overseas. Currently, PT Pertamina Lubricants sells one of its superior products for the automotive segment, which is Pertamina Fastron Synthetic Oil Series, including Fastron Gold and Techno.